Even with NHL players not participating in the Olympics, no one predicted the four teams that would wind up in the semifinals. Canada and Russia/the Olympic Athletes from Russia, absolutely. They're among the five nations that regularly dominate international hockey. The Czech Republic? Maybe, but they're certainly not the team they were some years ago, and they weren't favored by many to make the medal rounds over the US, Sweden or Finland. But the biggest surprise is Germany, who upset the Swedes in the quarterfinals, finishing Sweden's hopes for a medal. It was a massive upset. The Germans aren't even currently in the top division for the IIHF World Juniors or the U18 tournament. In fact, in pre-tournament betting predictions, Germany was ranked behind the five mentioned earlier, as well as the Czech Republic and Switzerland. 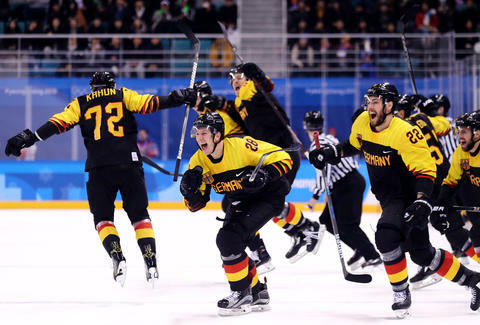 Yet, in the quarterfinals, Germany took Sweden to overtime and, after the goal was reviewed, eliminated a team that was predicted by many to medal. Upsets are always fun. But even if you really enjoyed watching this upset, you probably didn't enjoy it as much as the announcers for the German broadcast on Eurosport.de.